The Speedtail can achieve the highest maximum speed of any McLaren to date, reaching 403 km/h, while delivering a blend of contemporary craftsmanship, materials innovation and bespoke personalisation. Just 106 units will be created and all of them are already reserved for customers, starting at an eye-popping price of £1.75 million. “McLaren has never built a vehicle like the Speedtail before,” said Mike Flewitt, Chief Executive Officer at McLaren Automotive. “As our first ‘Hyper-GT’, the Speedtail is the ultimate McLaren road car; a fusion of art and science that combines an astonishing maximum speed with an iconic central-driving position and a truly pioneering approach to bespoke personalisation. As the most powerful and most aerodynamically drag efficient McLaren, the Speedtail can exceed the 243mph record peak speed of the McLaren F1, a feat made possible by intense collaboration between McLaren’s design and engineering teams to deliver a peerless blend of aerodynamic, powertrain and dynamic excellence. The Speedtail model is built around a bespoke McLaren Monocage carbon fibre structure and benefits from lightweight engineering throughout, including an all-carbon fibre body, aluminium active suspension and carbon ceramic brakes. The powertrain is a pioneering petrol-electric hybrid developing a combined 1,050PS to support the car’s performance. The Ferrari 488 Pista Spider, has been unveiled during the world-famous Concours d’Elegance® at Pebble Beach in California. Greenline 45 Fly will have its launch at the 2019 Düsseldorf Boat Show. 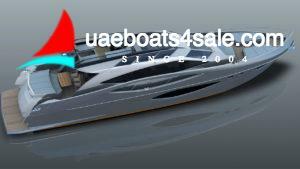 With naval architecture and exterior styling by J&J Design and an interior penned by Italian Marco Casali the 45 promises to be an attractive package. There are some familiar Greenline style cues in place, like the buttresses that cover the side decks at the aft end and a window that runs around the coach roof to draw light into the VIP cabin. Note how there are cut-outs in the bulwarks to improve the view out, too. The master cabin amidships is full beam and sits low in the deck to create as much headroom as possible. Lower deck layout options include a three-cabin arrangement with bunk beds to starboard, a version with day head access to the VIP ensuite or a pair of sizeable walk-in wardrobes for each cabin in place of the bunks. There are plenty of engine options too, including a hybrid system. Here, a pair of Volvo Penta D6 370s on shafts are mated to a 40kw electric motor for a top speed of 6 knots on electric power alone, though the range is yet to be revealed. On diesel power the top speed is 25 knots. The 24 metre catamaran, which is completely powered by solar energy captured by extensive flybridge panelling, is scheduled for delivery in March 2020 and is being built by Consorzio Navale in Marotta, Italy. Silent Yachts also revealed that construction has begun on four additional models, including a 21 metre 70 “E-Power” catamaran. The Silent 79 Cruiser concept was designed by Michael Köhler and features naval architecture by Enrique Castilla of Insenaval, and exterior and interior design by Marco Casali of design studio Too Design. The catamaran, which has a beam measuring 10.95 metres, is powered by two electric 80kW engines with a battery capacity of 200kWh. The yacht will be entirely solar powered, enabling an unlimited cruising range and noise and fume free navigation. The solar panels, which adorn the yacht’s flybridge and provide its power, come with a 25-year warranty while the battery banks come with a 10-year warranty. The 79 model is available in a number of layout versions and can accommodate a maximum of 10 guests across five cabins. These can either feature a double bed or two singles. The owner’s front cabin features an en suite and walk-in office with a desk, locker storage and large mirror. Silent Yachts’ 16.7 metre 55 model will be on display at the Cannes Yachting Festival. Ferretti Group the Italian yard has revealed that the first hull of its new Ferretti 780 range of 24 metre flybridge yachts hit the water in Cattolica on June 22. One of the yachting industry’s most renowned entrepreneurs, Carlo Riva died peacefully on (April 10) in his hometown of Sarnico. Born on February 24, 1922, Carlo Riva followed in the footsteps of his father Serafino, his grandfather Ernesto and his great-grandfather Pietro when he joined the family business at a young age. The newest member of the Riva dynasty went on to lead the company into an unprecedented golden era. One of the earliest examples of a Carlo Riva-era speedboat was the Riva Ariston. He described it as “strong and pure, like a thoroughbred horse”. Legendary models such as the Riva Florida, the Riva Tritone and the Riva Sebino were also launched under his tenure, culminating with the 1962 debut of the Riva Aquarama, which has come be to considered as one of the true icons of yachting. Now part of the Ferretti Group, the Riva brand has grown to encompass everything from sporty 12 metre tenders to 50 metre steel and aluminium superyachts.